Jordan Hicks is a very good player, but can he stay healthy? 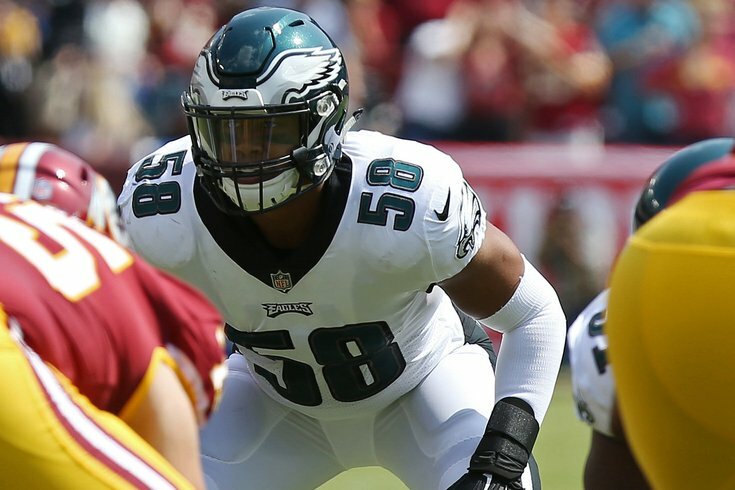 With the main focus of attention on the recovery of quarterback Carson Wentz, linebacker Jordan Hicks has become something of a forgotten injured man who is projected to return to the starting lineup after rupturing his Achilles in a Week 7 win over the Washington Redskins last season. On Tuesday, Hicks said that his recovery is going well. "It has been a very good rehab," he said. "It feels like since Day 1, I've been ahead of schedule. Doctors and training staff are pleased with where I'm at, just progressing every day, constantly trying to get stronger, trying to get my explosion back. "We've got a lot of time on our hands, so really the mindset, especially right now with so much time, is just progressing every day. We don't want to put too much workload on it. We don't want to put not enough. We're trying to stay in a good range." In his first 24 career games in the NFL in 2015 and 2016 (21 starts), Hicks had 135 tackles, 2 sacks, 7 interceptions, 1 forced fumble, 4 fumble recoveries, and 14 pass breakups. That is outstanding production for any linebacker, much less one in his first year and a half in the league. "When I'm healthy, I'm productive," said Hicks. "For me, it's stay healthy, play your game, and let it happen. There isn't any question in my mind that if I'm healthy, I'll be productive." In 2017, Hicks' start to the season before his injury was comparatively unproductive, though Hicks pointed out that he was dealing with an ankle injury, something he hypothesized may have helped lead to his ruptured Achilles. "I was dealing with that ankle injury, the opposite ankle," Hicks explained. "When you're dealing with one thing, you're susceptible to another. It's just the way your body works. As I've become a pro, you learn to become smart in understanding and you have to say no at some point. Whether it's pride, or whether it's the things that are in my head, I decided not to come out. I played against the Chargers, I played against Carolina, I played against the Arizona Cardinals, all with a bum ankle. At the end of the day, hindsight is 20/20." When he's healthy, there's no question that Hicks is a very good player, but as even he acknowledged, it's merely a matter of whether he's able to stay on the field.